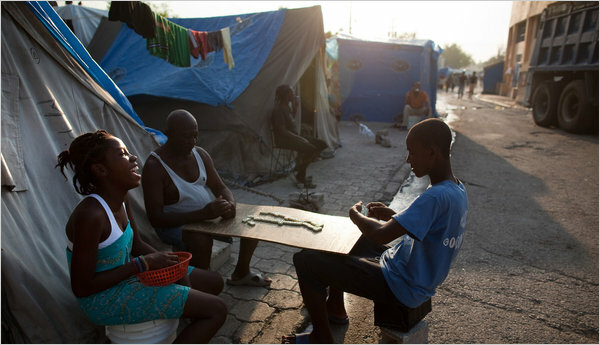 PORT-AU-PRINCE, Haiti — The way Robert Darvin sees it, he is one of the lucky ones. After being evicted from a tent camp a few months ago, he, his wife and their three children crammed into a rebuilt home the size of a small U-Haul trailer. But at least a roof shelters their heads, even if a flimsy one that allows the rain to pour through. Dugary St. Jean, 29, said he left a downtown camp in November with his pregnant wife to return to Fort National, a hilly neighborhood east of downtown with row after row of crumbled houses. At the camp, they often heard gunshots. They were robbed. Finally, they decided their baby, now 6 weeks old, would be safer almost anywhere else. They packed up their tent and headed to the house of a family friend. It is heavily damaged but has a small, spare room where Mr. St. Jean, his wife and their baby now live — along with his mother and nephew. “I survive day after day thanks to others,” he said. Diplomats have complained of red tape in Haiti and the uncertain outcome of last year’s chaotic presidential election, which was finally resolved when a popular singer, Michel Martelly, prevailed in a runoff in March. He takes office in May, and has pledged to speed things up. The Haitian government, in turn, has said that some 10,000 nongovernmental groups have failed to coordinate with them, slowing project approvals. As the delays have continued, waves of people have left the camps, often with nowhere to go. In a survey of 1,033 residents from 22 dismantled camps, the migration group found that evictions accounted for the largest share of departures, about 34 percent. But high crime (13.6 percent), poor conditions (13.9 percent) and the threat of rain or hurricanes (16.4 percent) also took a toll. Hundreds of camps have disappeared entirely; there are 1,061 now, down from a peak of 1,555 in July. One of the more striking examples — a jumble of more than 300 tents and lean-tos perched precariously along the thin median of a six-lane road — was dismantled in January after officials found space nearby for transition shelters housing 180 families. The plywood shelters, painted in a kaleidoscope of pastels in an industrial zone, are meant to be temporary, lasting three to five years. More than 100,000 such transition shelters were to be built in Haiti, but less than half of them have been finished, hung up largely by the slow pace of removing the rubble that still lines many streets and by the difficulties in finding land and financing. But even in this step-up from a tent, residents do not rest easy. Aid groups have walked a line between providing necessities like food and water and worrying that steady services would help turn the camps into more permanent shantytowns. Already, several camps sport barbershops, nightclubs and markets. Still, the camps are often woefully inadequate. Last week, 53 members of Congress urged the Obama administration to help, arguing that 38 percent of camps lacked regular water supplies. Nearly a third do not have toilets, they said. Where toilets are provided, each one is shared by an average of 273 people. And it is getting harder to stay in the camps, whether because people are forced off the land or because they are tugged by the pull of home. Or both. When Marie Nicoles Méus and her four children were evicted from a camp in January, they moved into a mud-walled shack that her brother had built for his own family. 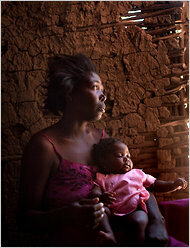 It is down a garbage-strewn trail, but even with mosquito swarms, flooding, stifling heat and cramped quarters shared with a friend and her baby, Ms. Méus takes comfort in being close to relatives. © 2011 The New York Times Company Reprinted from The New York Times, International, of Sunday, April 24, 2011.